The Jury of the 2015 San Telmo Awards convened at the central office of the Professional Association in Galicia on November 24th 2015 at 1330 and after assessing the projects submitted to the Awards, informed the Managing Board of the Professional Association of Civil Engineers of Galicia that the second prize for the 2015 San Telmo Awards for a project concluded in Galicia during 2013 and 2014 should go to the remodeling of the O Pino junction, N-550 km 124,3 and PO-10 with was executed with the technical services of Azierta. 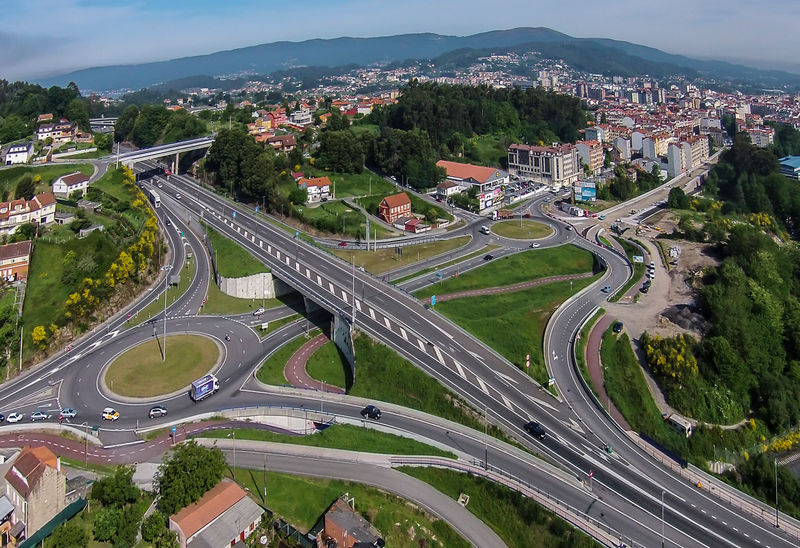 The remodeling of O’Pino junction was commissioned by the department in charge of state-owned roads in the territory of Galicia. The technical services for its project management have been provided by Azierta while Sacyr was in charge of its construction. It is an extremely complex project (it includes a total of 22 axes with different cross sections and road surface sections) that solves the problem posed by a traffic flow in excess of 50,000 vehicles per day by connecting the N-550, PO-10 and PO-524 highways. The aim of the project was to transform the existing junction into one of a diamond interchange type consisting in two traffic circles, each of them with an outer diameter of 56 meters. The traffic circles are connected by highway N-550, with a divided highway with two lanes on each direction. The whole system is orientated within underpass on a North and South direction. Highway PO-10 directly connects with highway PO-542 in the existing traffic circle and creates a trunk on an overpass on an East-Western direction within the junction. Highway N-550 joins highway PO-10 by means of two traffic circles, except towards Vigo from highwayPO-10, which is through a direct branch. Highway PO-542 remains at ground level and is extended toward the right towards the Ourense toll freeway. The project includes pedestrian access consisting of sidewalks and a footpath and a bike lane 5 meters wide, that cross the junction in the North—South direction under axes 6 and 7 with two underpasses and an overpass over the N-550 in parallel to axis 4.